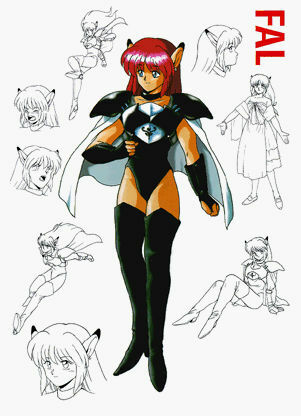 Second in a series of eight, this piece highlights Rika using her name from the Japan version of Phantasy Star IV, Fal. That various sketches show different emotional states, some action poses, and a much more casually dressed Rika. Larger versions of these will be seen in later images. You may view the gallery page for Fal. That dress she is wearing on the right looks quite similar to the style of clothing the female Numans wear in Phantasy Star Universe on Neudiaz. A whole lotta Rika!! Rika looks fantastic in the middle...wow!!!! The surrounding images of Rika here really show her with a lot of different emotions and poses. Last edited by Silver_Surfer1 on Fri Aug 31, '18, 6:58 pm, edited 1 time in total.